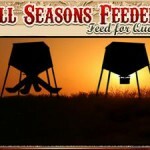 Lochte Feed & General Store offers All Seasons Deer Feeders. All Seasons Wildlife Feeders are built to hold up to the harshest environments Mother Nature has to offer. Their exclusive designs are made to deliver feed to target animals, while reducing waste on the ground. Talk to us today about All Seasons Feeder. We also have batteries, blinds and all the accessories you will need this hunting season. This entry was posted on Wednesday, August 28th, 2013 at 5:11 pm	and is filed under News & Updates. You can follow any responses to this entry through the RSS 2.0 feed. Both comments and pings are currently closed.